Gin just happens to be one of our favorite beverages. It's a versatile spirit with tons of variation between brands. And we were fortunate enough to see how two of the great gin producers of the ages—Beefeater and Plymouth—create it from scratch. It's Friday afternoon, you've made it through the long week, and it's time for Happy Hour, Gizmodo's weekly booze column. A cocktail shaker full of innovation, science, and alcohol. My blood-type is juniper. Distilling, in its crudest form, is only about 500 years old. Those early distilled spirits packed plenty of punch, but they were also quite nasty, the result of trial and error that ended more often in error. The beginnings of any batch (the "heads"), then and now, will often contain methanol and other nasty impurities. The end of the line (the "tails" or "feints") isn't much better. But while modern distilling practices have figured out how to isolate the good stuff in the middle, the original boozesmiths didn't know how to separate the wheat from the crap. The resulting spirit was the whole run, mixed together. It tasted awful. The Dutch were among the first to try to fix the problem, not by removing the impurities but by looking for ways to mask the flavor. Their best solution? Tossing juniper into the mix. And so gin was born. Advancements in still technology eventually allowed those early distillers to isolate the the middle or "mids," the untainted stuff that's actually potable. This gave them a spirit with a neutral flavor to it, which meant they could then use juniper and the other botanicals to add flavor and distinctive character, rather than just to mask nastiness. A lot of distillers start with gin because, in some ways, it's easier to make. Or, at least, there's immediate gratification. Unlike whisky, gin does not require any aging, so it's possible to whip up a batch from a fermented mash in less than a day (think "bathtub gin" from the Prohibition era). Surprisingly, most major gin distilleries—Beefeater, Plymouth, and pretty much anyone else you can think of—don't do the bulk of their own distilling. Instead, they purchase a high-proof neutral spirit from third-party suppliers, the identities of whom are tightly guarded secrets. Probably because it ends up being one of the major determining factors in the quality of a gin. The neutral spirit is generally 95-percent pure alcohol, however, "neutral" is a somewhat subjective term. Some are bitter, some are astringent. But the more that flavor is truly neutral, the better. Beefeater and Plymouth both use neutral spirit distilled from English wheat, but it's worth noting that it can come from anything from apples and grapes to sugarcane, even. Where gin producers set themselves apart is by adding flavors through re-distillation. First, the juniper berries and other botanicals (typically—but not always—angelica, coriander, orris root, licorice or anise, almond, and lemon or orange peel) are added to the neutral spirit and are allowed to soak, or macerate. Beefeater lets its ingredients steep for 24 hours before beginning the re-distillation process. Plymouth on the other hand, typically only steeps for about 90 minutes before firing up the still. Diff'rent strokes. Once the ingredients have steeped for the desired amount of time, the fires are lit under the pots, and the distilling process begins. The vat is heated to and kept at a very precise temperature. Alcohol has a much lower boiling temperature than water (around 173 degrees F), and so it's kept right around there so that the alcohol steam rises through a series of columns and pipes. As the vapor cools, it sinks back down, eventually turning back into liquid alcohol (now very pure). It is then collected in a series of large vats. Again, only the mids are kept. As the run goes on it gets nastier, so before that happens a valve is flipped, and the tails (or feints) go to a separate holding tank. You'd think that the heads would be fine for drinking since you're already beginning with a neutral spirit, but what happens is that the tails from the previous run coats the pipes, so when the new batch is fired up the heads acts as a solvent, and sweeps that nastiness through. This is why only the mids are good. The discarded heads and tails are later redistilled to about 95 percent ABV (they're only about 40 percent when they initially come out) and are sold to a third-party company that repurposes it. In other words, your mouth wash may be made with discarded gin. Almost enough to get you to start using it. Not only do these companies not do their own initial distilling, most don't do their own bottling, either. Beefeater and Plymouth both take their extremely high-proof gins, put them in tanker trucks, and then transport them up to Scotland. The gin is then cut with Scottish water (which is delicious, by the way), and bottled by the Chivas Brothers (as in Chivas Regal Scotch). It's then distributed from there. What ties all gins together is that the dominant flavor has to be juniper. But that leaves room for plenty of variation. Specifically, there are seven recognized types of gin: London Dry, Plymouth Dry, Navy Strength, Dutch, New Western Style, Old Tom, and Sloe. Beefeater makes London Dry. "London Dry" turns out to be a bit of a misnomer; it doesn't have to be made in London at all. What makes it distinctive is that no flavors can be added after the final pot still. In contrast, take Hendrick's, which has prominent cucumber flavors. That fresh cucumber flavor would not come through if it were tossed in the boiling pot still with juniper and the rest of the ingredients. Instead, the cucumber is put in a basket further down the pipe, where the alcoholic steam passes by it. Sloe Gin, another example, has sloe berries and sugar added after distilling. 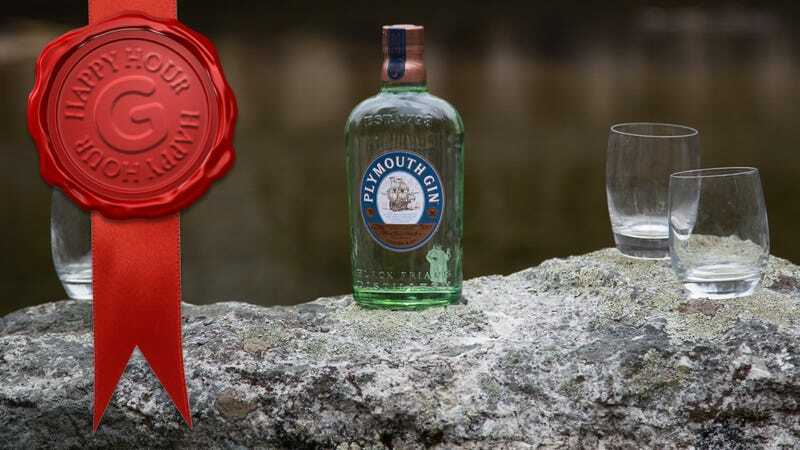 Plymouth gins can only be made in Plymouth, England, which means that Plymouth Gin is the only Plymouth gin there is, currently. Nice one, guys. Geographical distinctions aside, Plymouth Gin is basically a London Dry gin, as no flavors (or colors) are added after distilling. One of the big questions for these big distilleries is how they achieve consistency, year after year, and across so many batches. After all, a bottle of gin doesn't have a vintage like a wine. Indeed, it's something that must be somewhat obsessed over. Juniper berries are obviously the key ingredient. After all, no juniper, no gin. For that reason, both distilleries we visited buy two years' worth of dried juniper berries at a time. Juniper, surprisingly, is not a cultivated crop. Most of the juniper the two distilleries use grows wild in Italian national parks. Locals acquire foraging licenses, beat the bushes with sticks, collect the berries in baskets, and sell them to larger companies. Beefeater requires 50 tons of dried berries per year, and since there are subtle differences between the berries, it cannot pick from a single source. Instead, it relies on a blend from five or more sources, until it finds the right balance. If someone else buys one of the five they were after, they start over, smelling and tasting berries until the right combination of five sources are determined. Other ingredients are replaced on a staggered schedule. Plymouth, for instance, has it timed out so that they run out at different rates. That way the new batch doesn't have all new botanicals—just the orange peel, say, will be replaced. A couple of months later, the coriander will be swapped. This helps to compensate for the subtle variations within the ingredients, and, of course, the distillers taste all of the new additions to keep them as consistent as possible. They continue to strive for consistency on the stilling side, as well. Plymouth, for example, always mixes 50 percent of the current run with 50 percent of the last run, so what differences there are between batches gets diminished somewhat. They have the stilling very dialed-in, with very precise measurements and timing for everything; however, they still taste and smell as the run goes, because like cooking, it really is more of an art than a science. The master distillers at both Plymouth and Beefeater have been at their jobs for decades, and have the kind of refined taste that only experience can bring. "Two plus two doesn't always equal four when you're dealing with flavor," said Beefeater's Desmond Payne, who has been distilling for more than 45 years. Obviously, this only scratches the surface, but it gives you a bit of a primer into the world of distilling gin. Now that you know what it is and how it's made, stay tuned for some rather delectable gin recipes in the weeks to come. Don't miss the next Happy Hour.